I’ve written before about the trials and tribulations of owners with felines who stop using the litter box. Inappropriate urination is an incredibly common problem, and one of the most frequent reasons that cats are relinquished to shelters. 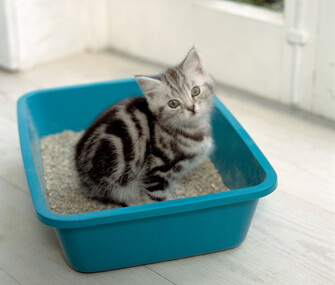 A decade of practice in veterinary medicine has brought to my attention a number of litter box misconceptions, miscalculations and misappropriations. 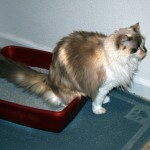 Read on to see if you might be guilty of some common “litter box no-no’s” that can be avoided to ensure that Fluffy has the most welcome and inviting litter pan environment possible. These really seem like an excellent idea. Self-cleaning pans have a mechanical arm that “sweeps” through the litter, automatically cleaning the pan after Fluffy has made her deposit. Most self-cleaning pans are equipped with motion sensors, so they can be triggered by the presence of any feline who steps in the litter box. Other pans just routinely sweep the pan at a regular interval, whether Fluffy has used the pan or not. I’m all in favor of regular litter box cleaning; routine scooping of the litter box is the single best thing you can do to ensure that Fluffy uses the box regularly. However, my experience is that the majority of cats are frightened by the scary, noisy, unexpected movements of self-cleaning litter pans. Time and time again I’ve had owners come to the clinic seeking help because Fluffy started urinating on the carpet for “no reason”; upon questioning, it becomes apparent that there was a reason for Fluffy’s litter pan strike: the newly-introduced self-cleaning box. When it comes to litter pans, simple is best. Most cats will avoid self-cleaning pans, so I strongly advise against them. Again, these seem like a great idea. 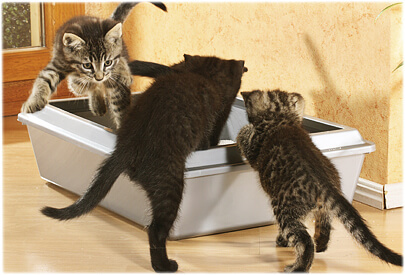 Covered litter pans help contain litter “scatter”, and they can also confine odors. Unfortunately, while these attributes make covered boxes a preferred choice for cat owners, they are not preferred by our feline friends. While urinating or defecating, cats are in a vulnerable position. Their natural behavior is to visualize every direction while eliminating, to ensure no “predators” are approaching. While you and I may know that no predators are hiding in the basement to terrorize Fluffy while she urinates, Fluffy’s instincts tell her to always be aware. Thus, she may choose to avoid eliminating in a covered area where she feels vulnerable. Second, I’ve heard covered litter pans compared to port-o-potties; this comparison makes complete sense to me: nothing is worse than being trapped in a small, enclosed space with highly unpleasant odors. A cat’s natural instinct is to avoid malodorous, over-saturated litter areas. Small litter pans have an advantage, especially for apartment-dwellers and those living in close quarters. Unfortunately, teeny pans can also discourage Fluffy from using them. Due to the obesity epidemic in our feline friends, many of our cats are bigger than the pans provided to them. Cats like to dig, swivel, turn and move around when eliminating. 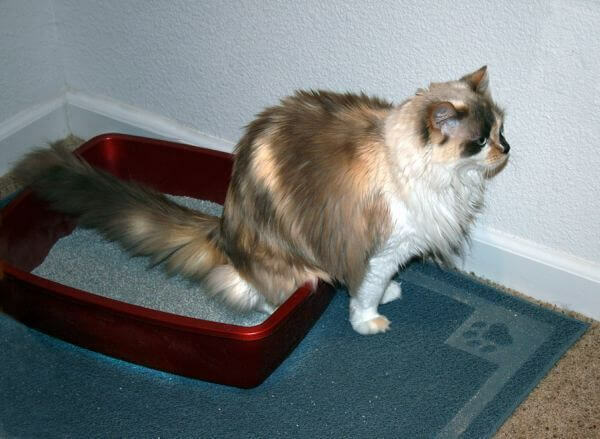 Tiny pans prohibit this natural feline behavior, and often cause Fluffy to hang over the edge of the litter pan, making “deposits” over the side of the pan. Bigger pans are always better for cats! 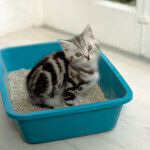 When choosing a litter box, select the deepest, widest pan available. Feline behavior experts often recommend repurposing large Tupperware storage containers for this purpose. A litter pan can’t be too big for Fluffy, but it definitely can be too small! The golden rule of litter pans in multi-cat households is that you need at least one pan per cat, plus one extra pan for good measure. More cats means more excrement, which means that the litter boxes will become dirtier faster. Soiled pans are avoided by cats. More pans means more opportunity for Fluffy to find a clean spot to eliminate. Households with multiple cats simply cannot have too many litter boxes! More is better! 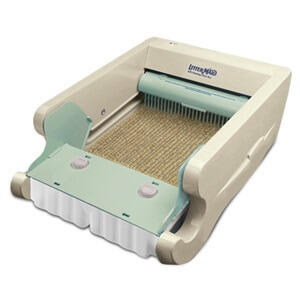 The simplest, easiest, most cost effective thing that cat owners can do to prevent litter box troubles is to scoop the pan a minimum of once daily – without exception. Cats want clean litter pans. 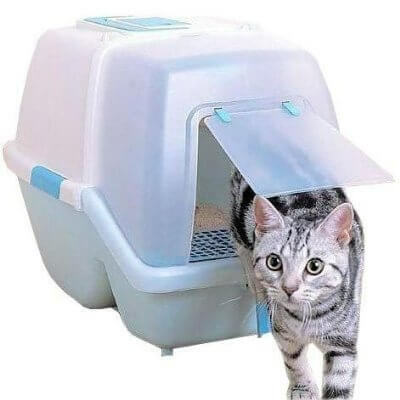 Every cat owner knows that Fluffy comes running when she hears the sound of the litter box being scooped, so she can rush in to use it once it’s clean. Too often, cats begin eliminating outside the litter box out of necessity when the pans are overflowing. Once Fluffy stops using the box, it can be difficult to encourage her to begin using it again. I’ve seen many households over the years where children were assigned the chore of scooping the litter box, and without parental supervision, the litter boxes quickly began overflowing. My son is actively involved in the care of our pets (he feeds them and helps with grooming) but I know at age six, he’s not responsible enough for litter box scooping. Scoop those pans once a day; dump all the litter and scrub the pans thoroughly once a month. To keep her happy, want to create the most optimal litter box environment for Fluffy: provide a clean, wide, deep, simple, uncovered pan. Simpler, and cheaper is better when it comes to litter boxes! Please Don’t Waste Your Money!